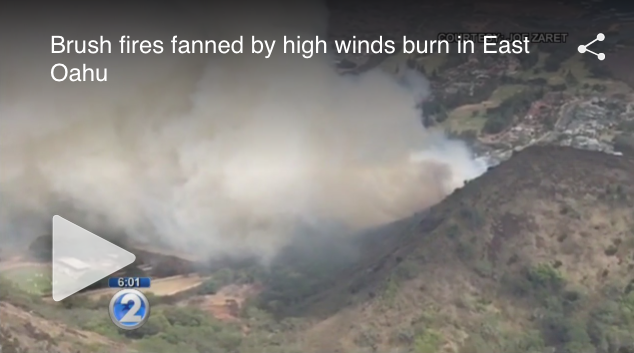 It may be surreal to watch as horses are led through sidewalks of paved streets in an urban neighborhood, but that was the reality on Saturday, February 4th when a couple wildfires in East Oahu filled neighborhoods with smoke (and burned to the edge of a home). If you have pets or livestock on a property, follow the step-by-step evacuation plan checklist on pages 15-16 of the Ready, Set, Go! Wildland Fire Action Guide. Personal recreational drones complicated the firefight for Honolulu Fire Department. Please make sure to keep drones out of the air during wildfires as they are a safety hazard for helicopters. A trending YouTube video is not worth risking the lives and safety of our firefighters and communities. "There were tense moments for homeowners, with one house just feet away from the scorched ground. Firefighters were stationed nearby to safeguard homes. The fire was called contained at approximately 3:45 p.m. No homes were damaged or directly threatened by the fire, and there were no evacuation of residents. Jenkins did say that the fire did go up and into Koko Crater and the stables were evacuated. None of the horses were injured."